It's a magical thing, the guitar. I first started playing guitar when I was thirteen years old. It was my first love. Outside of some beginner lessons, a semester of music in college, and several years of studying classical violin with a private teacher in Texas City, I am largely self-taught. Along with being in a band for a while and jamming with friends, I have learned from listening to and watching other players. I believe that learning to develop your musical ear is crucial to becoming a good musician--although being able to read music is very helpful. Since retiring from public library service a few years ago, I have worked as a guitar tutor with students of all ages. The greatest joy for me is to see the light of understanding come into their eyes. Patience is my strongest asset; everyone learns differently, especially with the guitar, which is such a versatile instrument that it can be played any number of ways. My goal as a teacher will be to help you find your way. 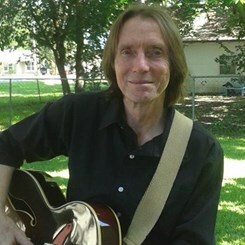 I invite you to come with me now on a musical journey into the fabulous world of the guitar, starting right here at Music & Arts in Webster, Texas! Request Lessons with GREGORY today!